Helderberg Hospice are holding a photography competition to raise funds. The exact prizes have not yet been announced as they’re awaiting final confirmation but they have been promised a camera as the prize for the overall winner. Once they notify us of the exact prizes we’ll update this post with the details. I have asked about copyright implications as I know this is of concern to some of our members. This is the answer I received. As far as copyright goes we only ask (on the entry form which as to be completed in-store at Kodak Waterstone and Somerset Mall) for the right to exhibit the winning photographs at an Open Day at Helderberg Hospice in November. Winning photographs will be sent each month to Bolander, District Mail and the Gordon’s Bay Review for publication. We would also like to post those photos on our Facebook page as part of the promotion of the competition, but we would always credit the photographer for the use of the photo. Here are some details of the competition. You can also click the image above to see a larger version of the poster. Whether you’re serious about photography or just a happy snapper, your photographs could make you a winner in the Life in Full Focus competition launched by Helderberg Hospice in conjunction with Kodak Superfoto. There are three categories in which to enter and you may interpret them as widely and creatively as you like. Action photo lovers may enjoy entering the Making the Most of the Moment section, while parents as well as those who specialise in macro photography could find their niche in It’s the Little Things that Matter. Anyone who has been stopped in their tracks by a spectacular view or sunset will want to enter the Wow! category. 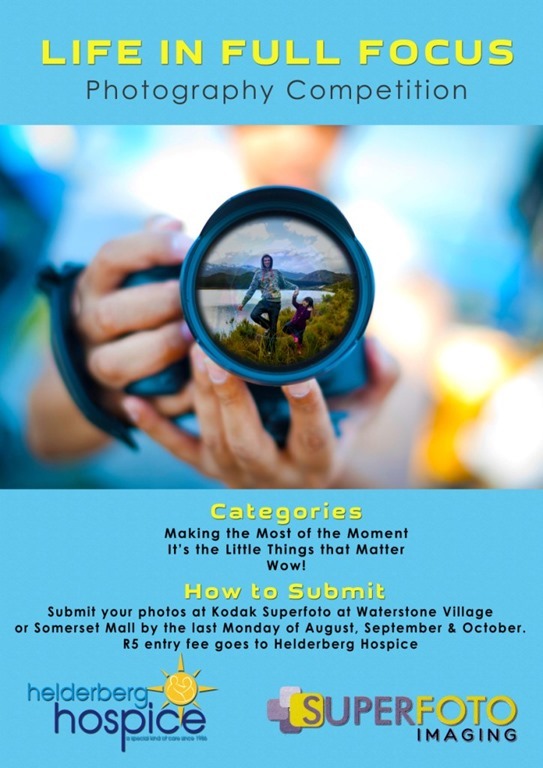 Photographs must be submitted for development to Kodak Superfoto at Waterstone Village or Somerset Mall by the last Monday of August, September and November. Monthly winners will be announced in the local media the following week and an overall winner of the competition will be announced in November. A R5 entry fee will go towards Helderberg Hospice and an exhibition of winning photographs will be on display at the Hospice during November.